Whether you’re a writer, photographer, philosopher, beer-expert, or all of the above, we need your talents to make this happen! If the idea of helping make Live Taos great is exciting, or at the very least if we can bribe you into helping with the promise of cookies, please email us at [email protected]. 1. Become a sponsor or partner! 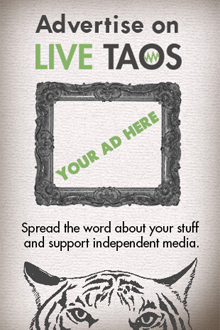 Email [email protected] to learn how your business or organization can support LiveTaos. 2. Like and follow us on Facebook! 3. Submit your events to our online calendar! 4. Add [email protected] to your newsletter distribution list; your newsletter will be published right here on LiveTaos! 5. Email us when you see something cool going on around town, and we’ll send someone out to cover it! 6. Finally, tell your friends. TELL THEM ALL.